Editor’s note: This is a live account of updates from Tuesday as the events unfolded. A full recap and forecasts for the rest of the week can be found here. 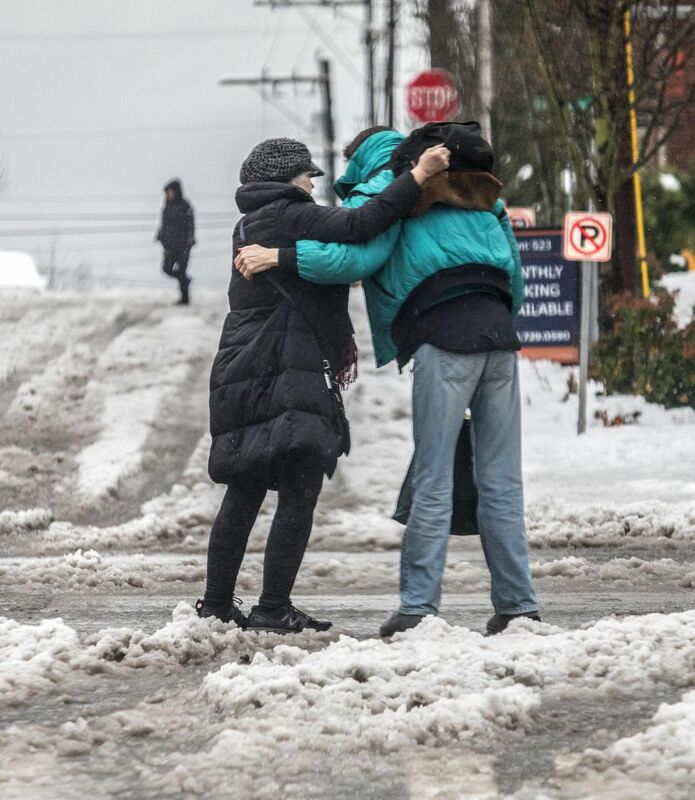 Freezing temperatures and back-to-back snowstorms caused havoc in the region, as flights were canceled, some residents lost power, blood supplies dropped and at least four King County residents died from exposure. 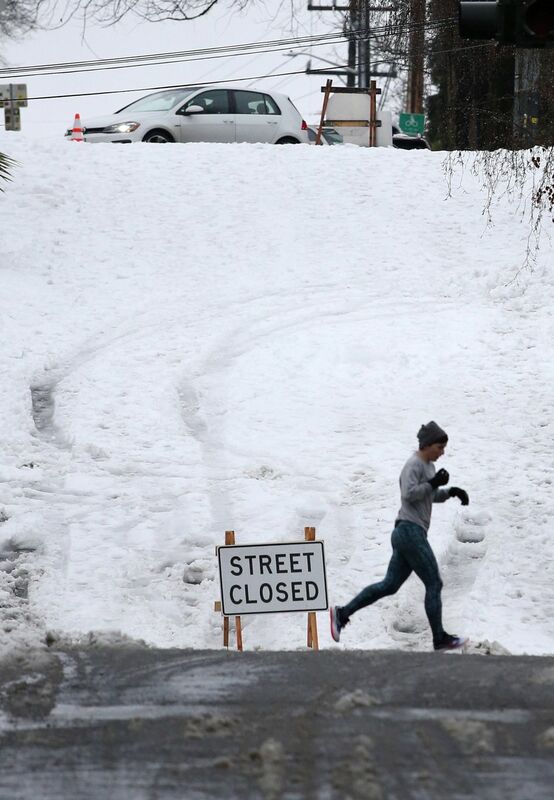 Schools in Seattle and around the region will be closed Wednesday. 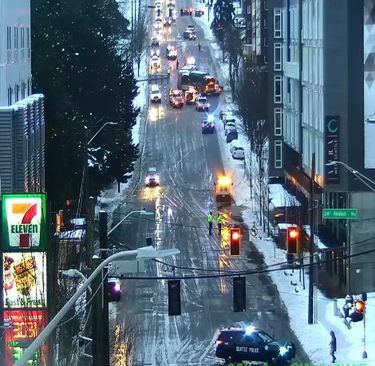 University of Washington will resume normal operations at 9:30 a.m.
Metro plans to restore 90 percent of its routes Wednesday morning, although some will run on less-steep snow routes. 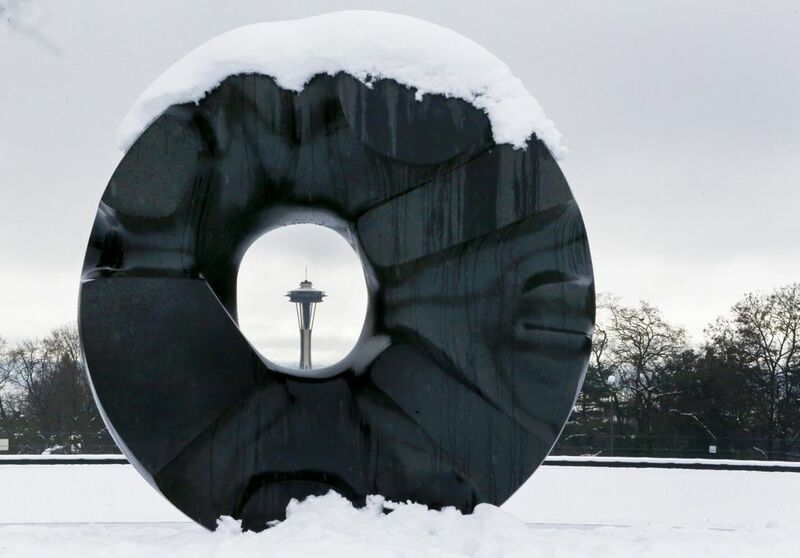 Seattle-Tacoma International Airport has received more than 20 inches of snow, making this the snowiest month in 50 years, according to the National Weather Service. Seattle City Light restored power to most of the thousands of customers affected by an outage in Northgate. 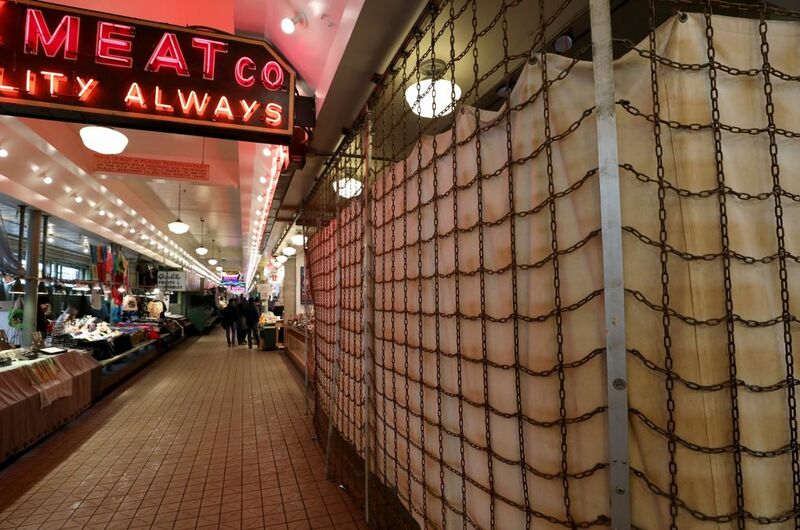 But around 800 Seattle City Light customers and 29,000 Puget Sound Energy customers remain without power. If your power goes out, don’t use gas ovens, portable propane or kerosene heaters for indoor heating, as they can lead to carbon monoxide poisoning. Generators also should not be used indoors. Here are more tips on what to do if your power goes out. Wondering who’s responsible for shoveling sidewalks? 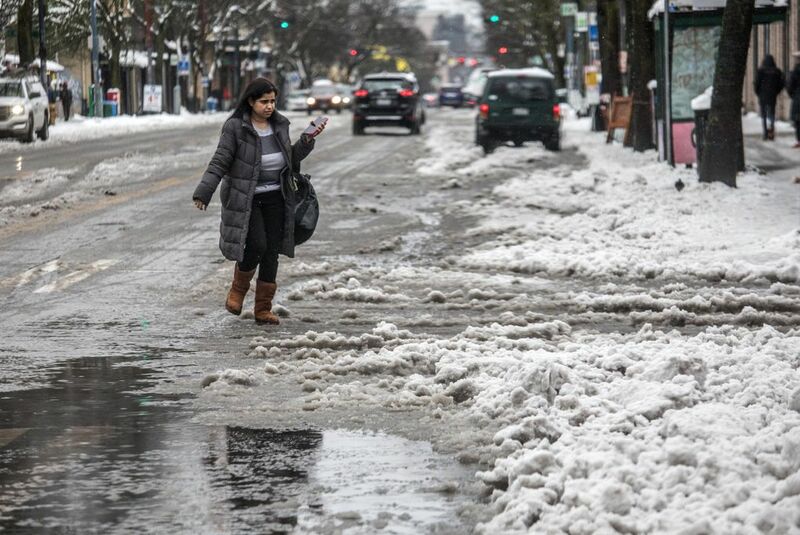 In Seattle, it’s property owners, who could face a $250 fine if they fail to clear adjacent sidewalks. If you come across a fire hydrant while clearing snow, fire departments have recommended clearing 3 feet around them. Officials have also asked residents to help clear storm drains if they notice any covered by ice or snow. Waste collection will resume in Seattle on Wednesday as long as weather permits, according to Seattle Public Utilities. Residents can help make collection easier by removing snow from around waste cans or moving them to areas more accessible for trucks. Property owners are also responsible for removing fallen limbs from privately-maintained trees, although if a fallen tree blocks a street or sidewalk, city crews will take action. 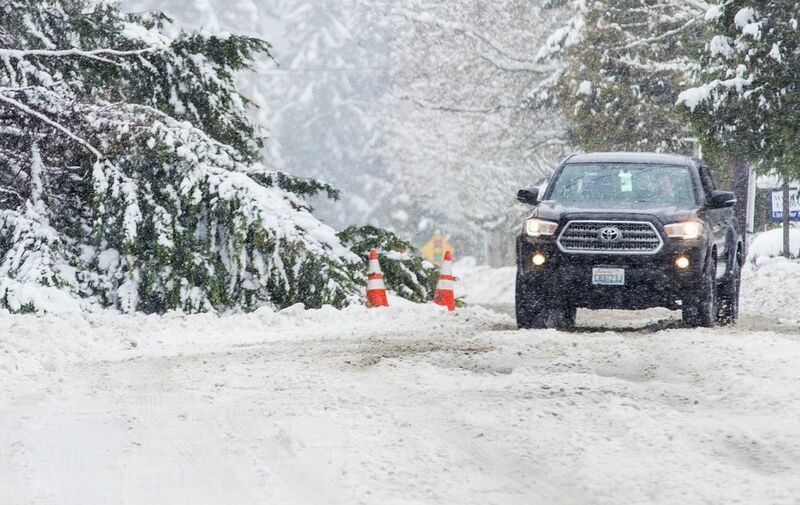 Residents can call the Seattle Department of Transportation 24-hour dispatch at 206-386-1218. 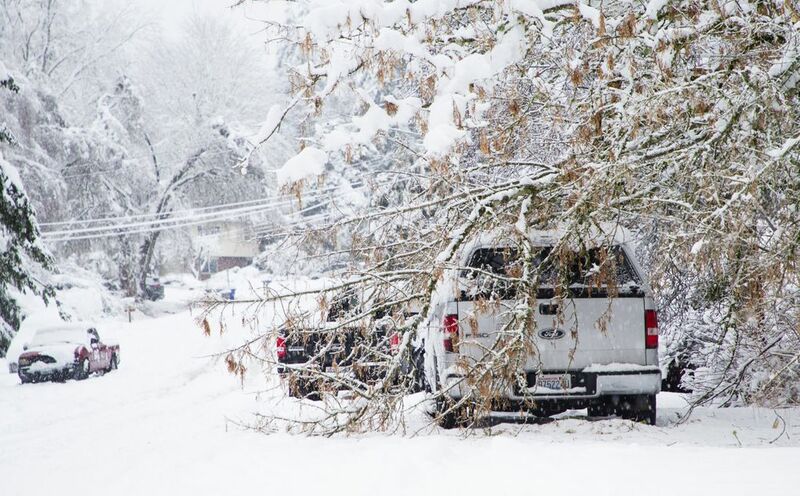 If a branch falls on electrical wires, residents should call Seattle City Light at 206-386-1733. 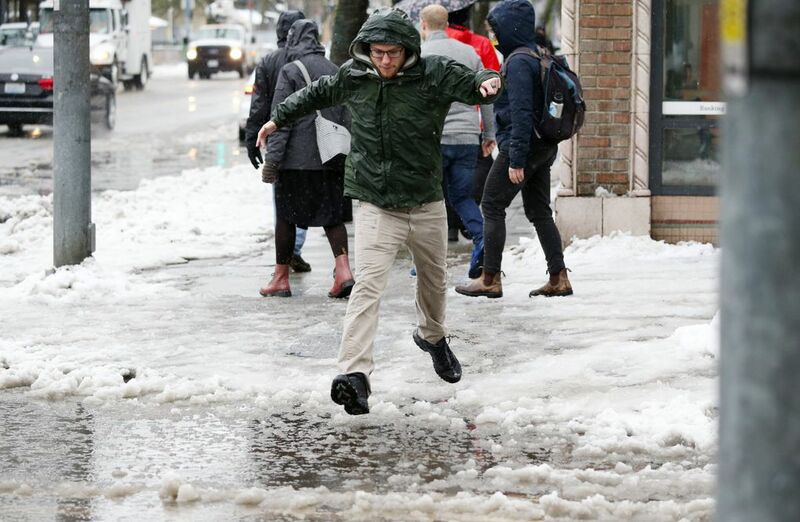 Seattle schools will be closed Wednesday, as well as schools in the Edmonds, Everett, Snohomish, Bremerton, Highline, Tacoma and Shoreline school districts. The University of Washington will resume normal operations at 9:30 a.m. at all of its campuses. Interstate 90 at Snoqualmie Pass will remain closed all night because of severe weather. The highway is closed for about 80 miles, eastbound from milepost 34 near North Bend and westbound from milepost 106 near Ellensburg. I-90 will be reassessed at 9 a.m. Wednesday, according to the state Department of Transportation. Closure updates are available here. 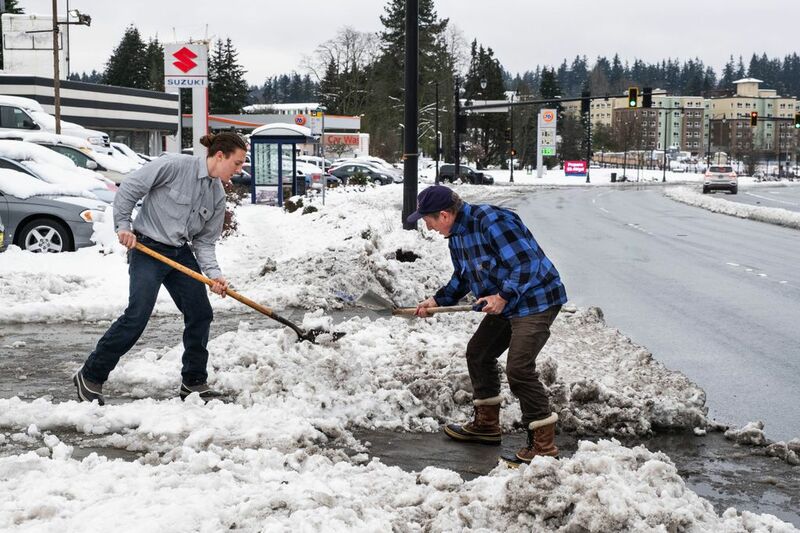 While the worst of the snow is over, the Puget Sound region isn’t completely in the clear yet, said meteorologist Mike McFarland with the National Weather Service in Seattle. There may be more snow and rain on Thursday, particularly in higher elevations, which could also see scattered showers before then. The weather service will have a better picture of what’s coming on Wednesday, he said. Snow is continuing in other areas of the state, as parts of Whatcom County, the Olympic Peninsula and the foothills of the Cascade Mountains may see more snow accumulate tonight. More than 4,000 Seattle City Light customers in Northgate lost power from a new outage, according to a tweet from Seattle City Light, which expected power to be restored by 7 p.m.
A total of 5,538 Seattle City Light customers and 48,841 Puget Sound Energy customers were out of power at 4:45 p.m. Significant power outages began Monday evening, as heavy snow mixed with rain brought down branches and power lines. The King County Medical Examiner’s Office reported another death from exposure on Tuesday, the fourth hypothermia-related death recorded by the office since the start of the cold snap. Barbara Arvidson, 74, died Sunday in Enumclaw from hypothermia brought on by exposure. Her death follows that of Derek C. Johnson, 59, who was found by a light-rail operator at the Sodo light-rail station in Seattle on Feb. 7. He had no permanent address, authorities say. 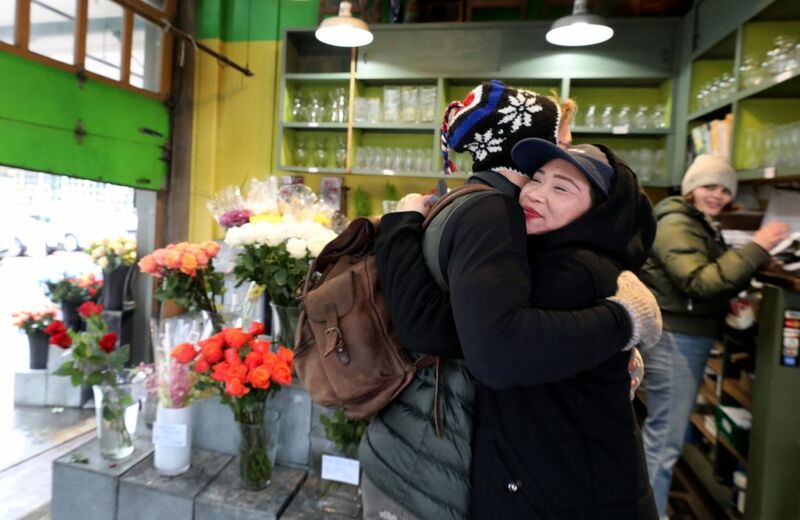 A vigil will be held outside of Seattle City Hall Wednesday for Johnson and others without homes who have recently died, organized by the Women in Black of WHEEL, the Women’s Housing, Equality and Enhancement League. Stanley Little, 84, was found dead from apparent hypothermia inside his Fall City home by his son last Thursday, according to King County Sheriff’s Office spokesman Sgt. Ryan Abbott. Carl Soderberg, 53, was found dead outside a neighbor’s home Saturday. Investigators believe he was checking on his elderly neighbors when he succumbed to the cold, Abbott said. An equipment malfunction at a King County pump station caused up to 750,000 gallons of wastewater to flow into Lake Washington, according to a statement from the county’s wastewater treatment division. The county reported the overflow from the Sweyolocken Pump Station in Bellevue to health and regulatory agencies and will monitor water quality, according to the statement. The county also posted signs warning people to avoid contacting the water over the next several days. The unmanned pump station went out shortly after 2 a.m. Tuesday during the storm. Normal operations resumed at 5:45 a.m. 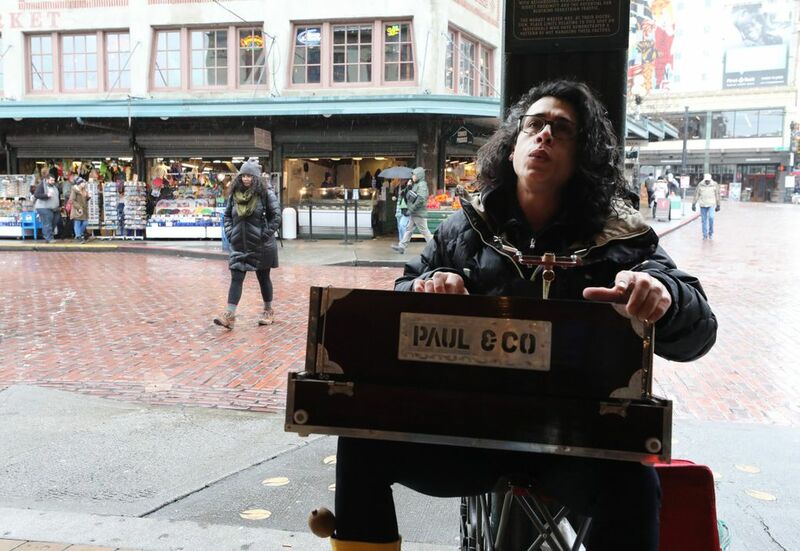 Temperatures will be at or below freezing tonight and Wednesday night for most of Western Washington, according to the National Weather Service in Seattle. The cold temperatures could refreeze moisture on the roadway, creating icy and hazardous driving conditions on side streets. Main roads likely won’t be affected, meteorologist Mike McFarland said. Washington State Patrol has responded to more than 400 collisions in King County since the snow started on Friday, Trooper Rick Johnson said in a tweet. Drivers should clear snow off their cars before they go, so it doesn’t affect the visibility of drivers behind them, he said. 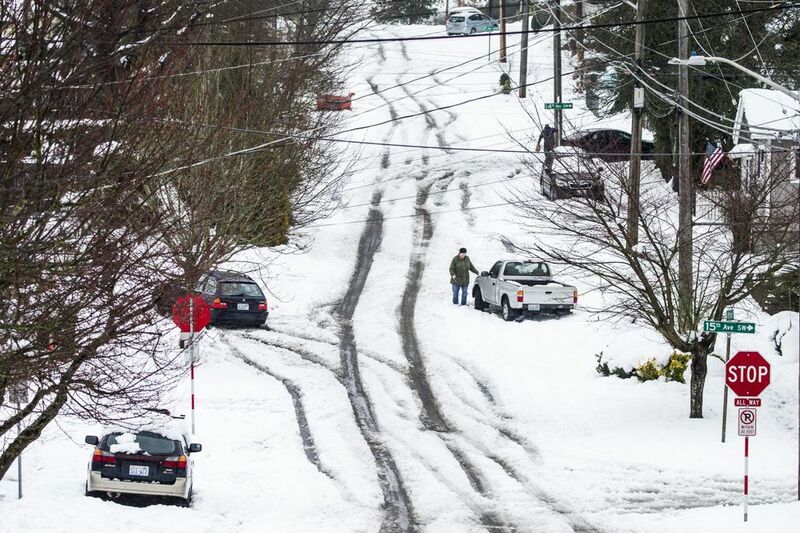 King County Metro says it will restore 90 percent of its routes by 4 a.m. Wednesday, but some will run on less-steep snow routes. Updated route information can be found on Metro’s website. Bus service has been reduced 60 percent as Metro operates its limited “emergency snow network” on mostly high-ridership, low-slope routes. Metro’s goal is to return to full service on Friday, general manager Rob Gannon said in a statement. But, after another week of chilly temperatures, he expects temperatures to warm up to around normal, and perhaps trend a little hotter than usual. “For the rest of spring, for March into April, there’s tentative evidence it will be on the warm side of the seasonal predictions,” Bond said. 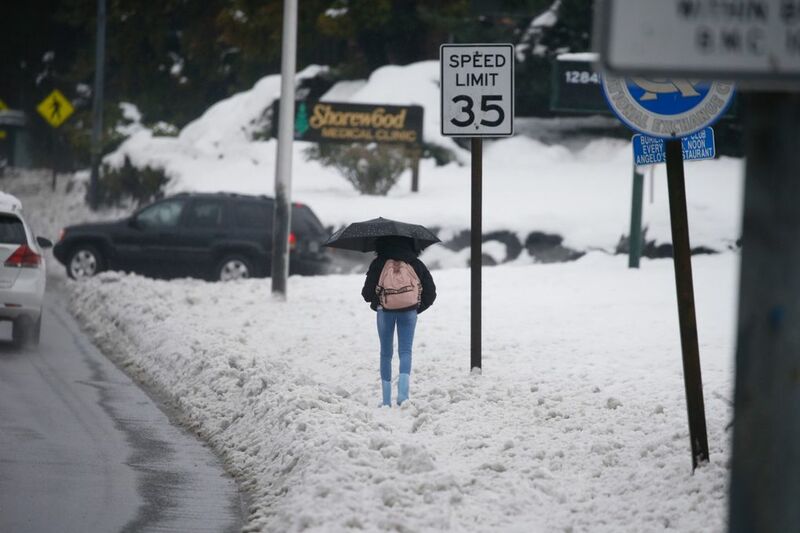 Weather like our snowy trend happens about once in a decade, Bond said. What’s going on? Instead of warm ocean air hovering over the Seattle region, pressure patterns are pushing cool air from the British Columbia interior into the Puget Sound area. Expect snow on higher hills and in the mountains for another week, Bond said. For those tiring of slush in their shoes, “hang in there, because this won’t last forever,” he said. 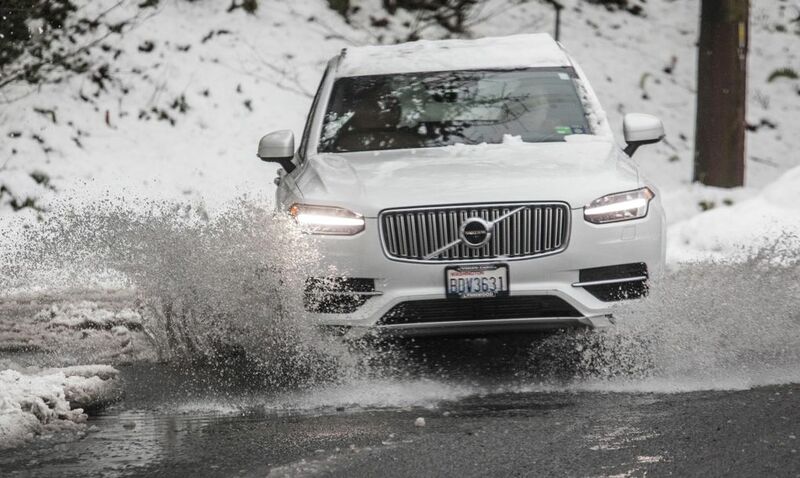 He’s enjoying the experience, despite the slush. “It’s amazing. This is the sort of stuff I live for,” Bond said. 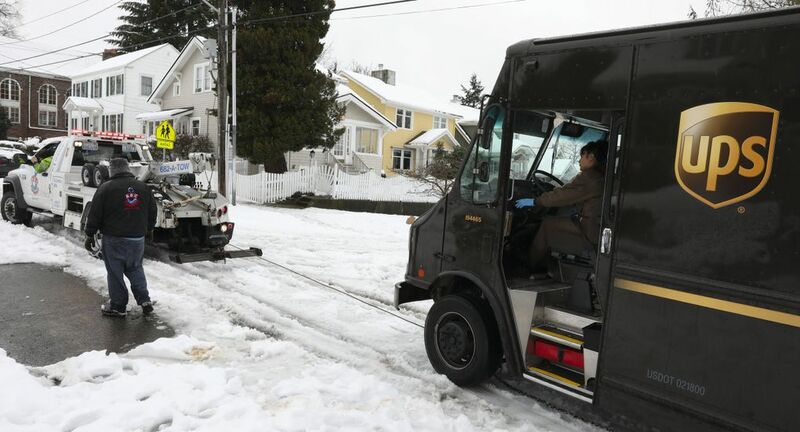 The storms that have hit the Seattle area have caused mail disruptions in some parts of the county at an especially inconvenient time — in the run-up to Election Day. The deadline for getting your ballot postmarked or getting it into a drop box is 8 p.m.
“We’ve been in regular contact with U.S.P.S. and service is definitely spotty, depending on where you live,” said Kendall Hodson, chief of staff for King County Elections Director Julie Wise. Hodson said that anyone who’s having issues with their mail should call the county elections office at 206-296-VOTE. There are more than 20,000 properties in Seattle that are in landslide-prone areas, according to the City of Seattle Department of Construction and Inspections. Those areas are at greater risk as rain falls on top of melting snow, which can add weight and cause slides. More information from the City of Seattle is available here. 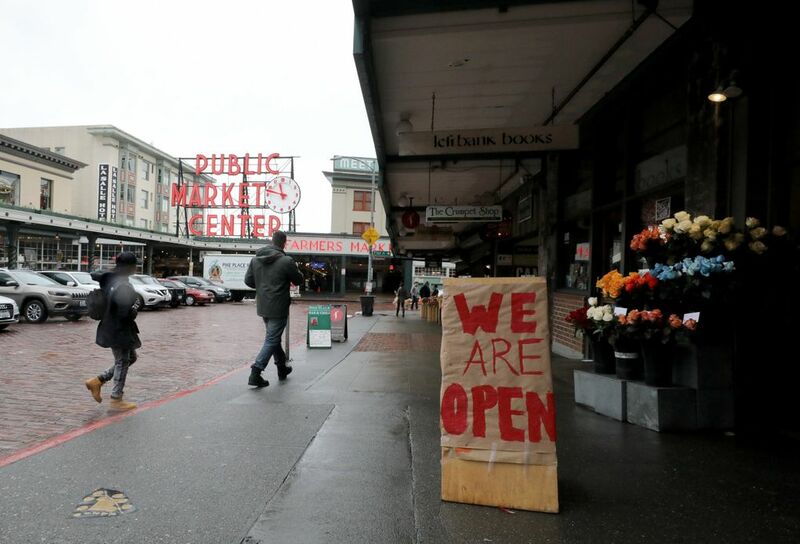 About 80,000 Seattle City Light, Puget Sound Energy and Snohomish County Public Utility District customers are without power throughout the region, according to the utility companies. In King County, Washington State Patrol troopers have investigated 407 collisions since the snow started falling on Friday, according to state patrol spokesman Trooper Rick Johnson. That total doesn’t include vehicles that were stuck in snow. Interstate 90 at Snoqualmie Pass will be closed all day because of severe weather. The highway is closed for about 80 miles, eastbound from milepost 34 near North Bend and westbound from milepost 106 near Ellensburg. About 53 inches of snow has fallen on the area in the past 48 hours, according to the state Department of Transportation. Closure updates are available here. The National Weather Service has issued an urban and small-stream flood advisory for west King County, northwest Pierce County and west-central Thurston County effective until 9:30 p.m. 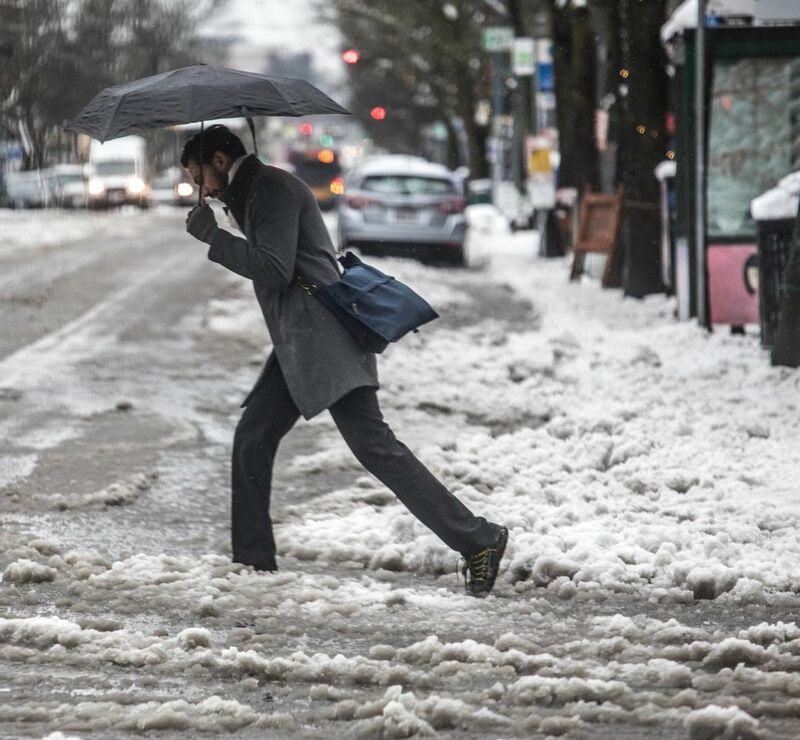 The weather service advises that excessive runoff from melting snow and rain will cause some flooding on streets and underpasses, and may increase the threat of landslides. 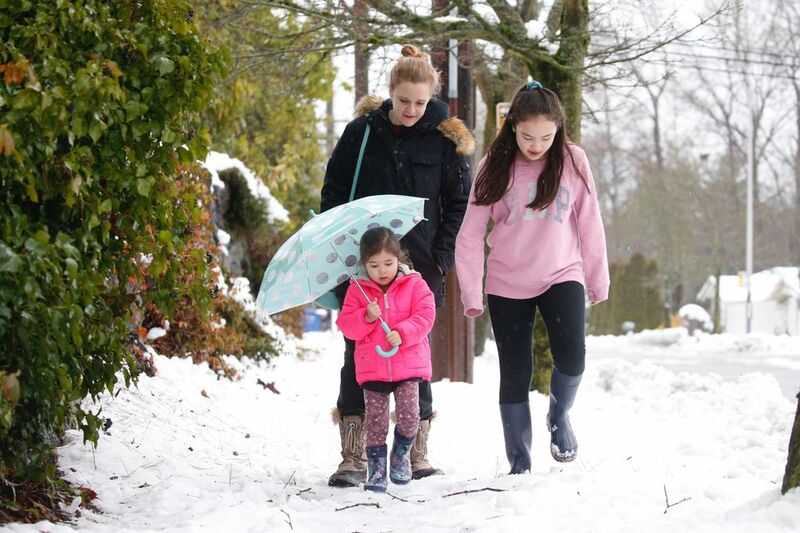 A winter weather advisory for some areas of Snohomish County, including Everett, Lynnwood, Marysville and Stanwood, remains in effect until 10 p.m.
9:40 a.m. Tuesday — Want to go skiing? The snow may be snarling traffic and causing outages in the Seattle area, but it’s been a welcome sight at some local ski areas. About 19 inches of snow fell at the Mount Baker Ski Area overnight and the Stevens Pass ski resort saw 16 inches in the past 24 hours. All ski operations at Snoqualmie Pass, however, are on standby after the area received 4 feet of snow in 36 hours. Interstate 90 remains closed eastbound from North Bend and westbound from Ellensburg because of severe weather and avalanches. If you’re stuck in the Seattle area, here are some places to ski and sled. There have been 52 delays and 130 cancellations at Seattle-Tacoma International Airport this morning, according to FlightAware. 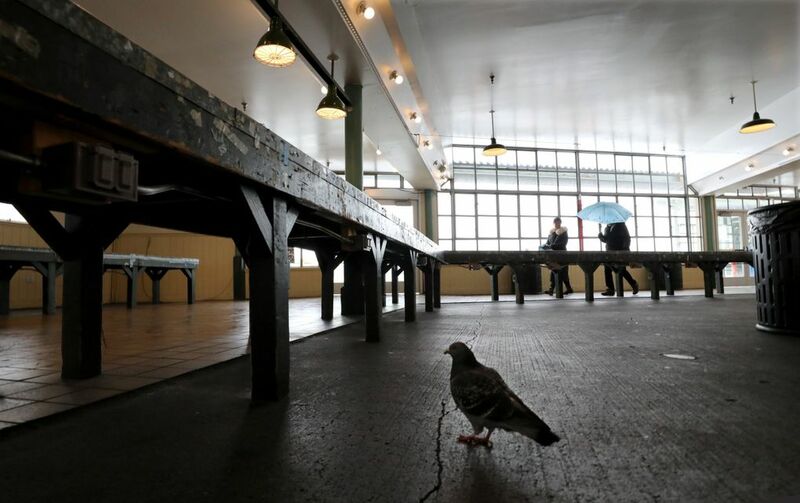 Some airlines, including Alaska, Delta and American, continue to offer flexible travel policies for customers flying to, from or through Sea-Tac who want to change or cancel their flights with no additional fees. Waste Management is attempting to do pickups for some Tuesday customers, but may not be able to reach everyone, the company said. Customers may drop off garbage at Lake Boren Park, Normandy Park City Hall and Marvista Park from 9 a.m. to 4 p.m. Waste Management has more updates for specific areas here. Recology CleanScapes has canceled collections for today, but customers may bring garbage to Hamlin Park from 7 a.m. to 3 p.m. today and Friday. Republic Services is not running any routes today. Rubatino Refuse Removal will not do any pickups today; Tuesday customers may put out triple their usual amount next week. 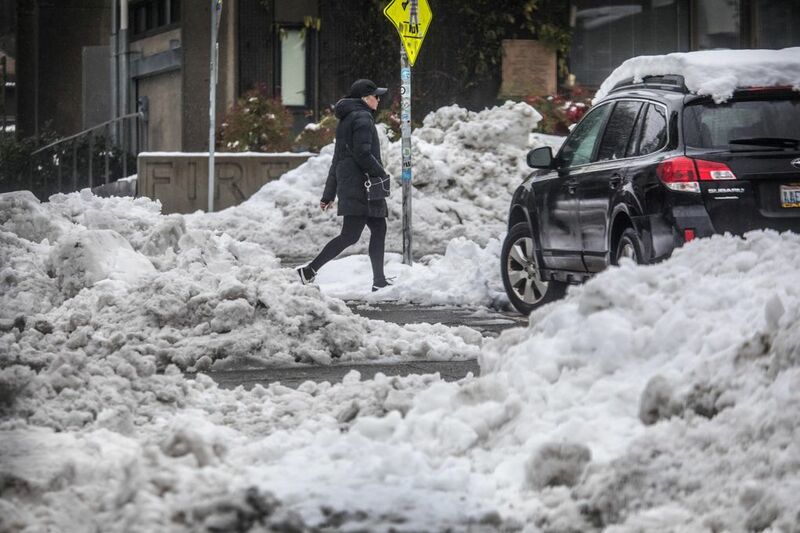 There will be no residential garbage, recycling or food/yard waste pickups in Seattle because of significant snow and ice remaining in the streets, Seattle Public Utilities said. Pickups will be on a delayed schedule, so Monday customers will have their wasted picked up on Wednesday. 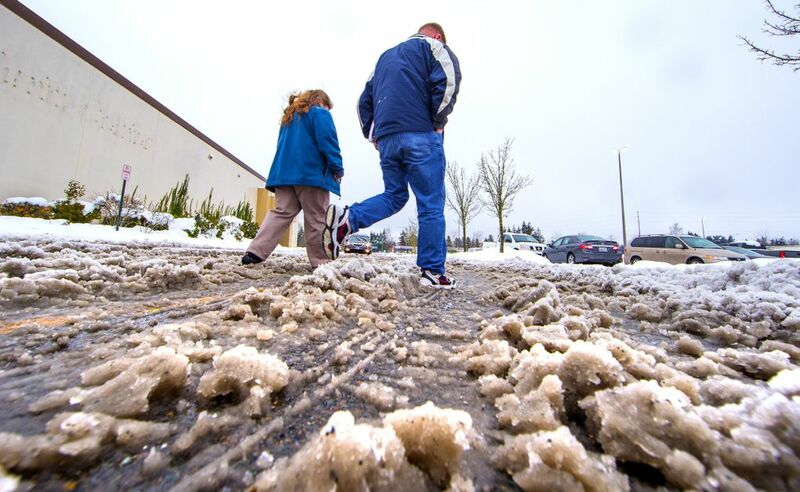 Transit buses throughout King and Snohomish counties remain on reduced snow schedules, and in some cases additional Community Transit trips are canceled, as slush covers Seattle streets and snow falls to the north. Conditions were tough Tuesday morning for riders on Community Transit, which warns about 45-minute delays for local routes, and 15- to 30-minute delays on commuter trips. The roundabout where riders are dropped off at Lynnwood Transit Center was closed because of icy surfaces, the agency said. 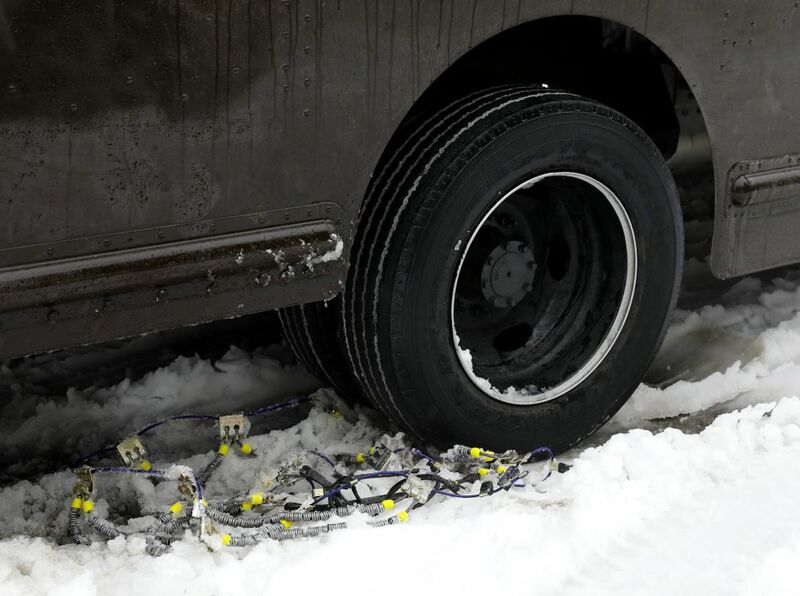 King County Metro Transit is operating its second weekday of its limited “emergency snow network” of mostly high-ridership, low-slope routes. 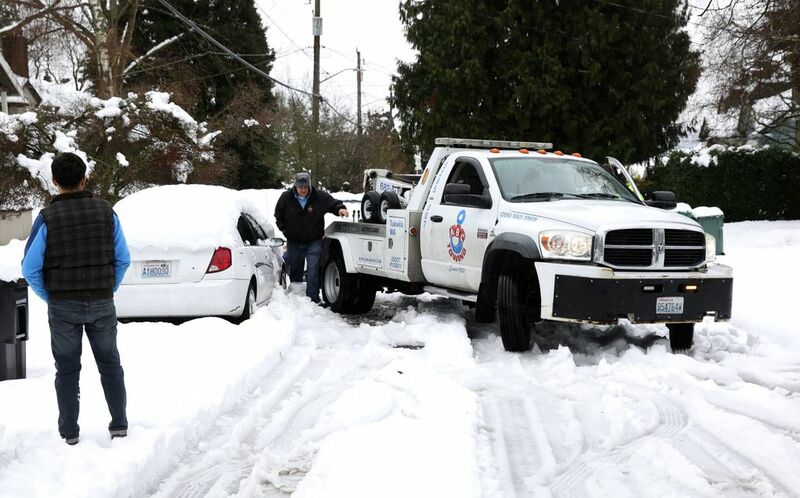 Service was reduced 60 percent and some areas are being skipped, including most of Queen Anne Hill. Sound Transit’s Link light rail has been running trouble-free. Sounder commuter trains have normal weekday schedules but are vulnerable to delays, for instance if switches freeze. In West Seattle, all southbound lanes of 35th Avenue Southwest are closed between South Alaska Street and Southwest Avalon Way because of a crash. All lanes of Highway 524 near Larch Way in Lynnwood are blocked by fallen trees. Highway 18 between Issaquah Hobart Road and Interstate 90 near Tiger Mountain remains closed because of a collision. Today is Election Day in 32 of the state’s 39 counties and, per state law, can’t be rescheduled even if there’s inclement weather. The deadline to return a ballot to a drop box is 8 p.m. This King County Elections tool shows the ballot drop box closest to your location. In Snohomish County, a list of available drop boxes is available here. The King County Elections accessible voting center at Union Station is closed today, but the accessible voting center in Renton is open. About 10,900 Seattle City Light and 72,400 Puget Sound Energy customers are without power, according to the utility companies. About half of the Seattle City Light outages are in northeast Seattle, where feeders — which transfer electricity from substations to neighborhoods — went down because of weather. The Puget Sound Energy outages are scattered across the region. Here’s what to do if your power goes out. 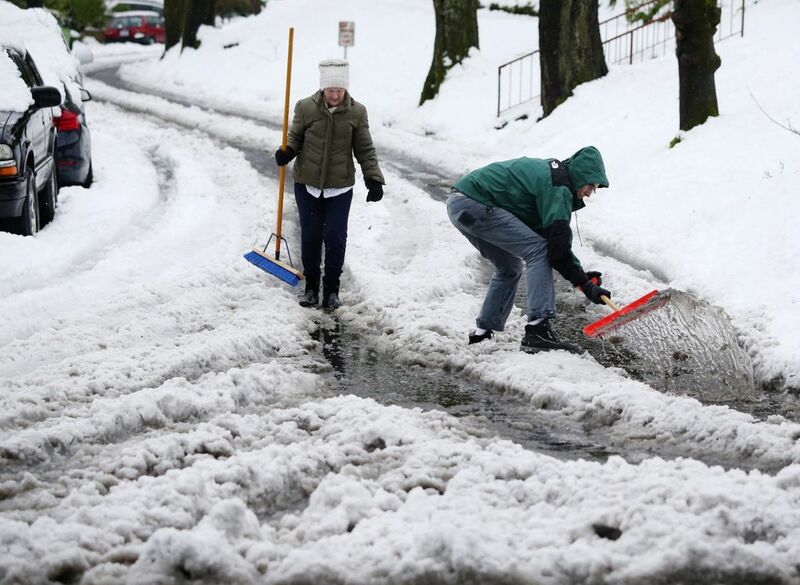 Snow has transitioned to rain in Seattle, but other areas continue to be hit with snowfall Tuesday morning. Snoqualmie Pass is closed because of dangerous weather conditions, according to the state Department of Transportation. The reopening time is unknown.